If you wish to reproduce your mare, you have to wait until it is three years old. Indeed, a premature gestation would have serious consequences in the growth of this animal. The period for the public covering of the donkeys is authorized between 15th February and 1st October. Apart from these dates, the foal can not be recognized by the National Stud farms. On heat is the period during which the mare is ready to be covered by the stallion. The period of heat generally starts at the beginning of spring until the end of the summer, but certain mare's are on heat throughout the year. The cycle is renewed approximately every three weeks until the mare is inseminated. When on heat it last between 4 and 7 days, it depends on the mare and the season, when on heat in spring it is often longer than in the summer. Most donkey mares in use will show by champing (opening and shutting their mouths and laying their ears back), urinating, holding their tails up and "winking" with their vulvas. The heat signs depends on the mare. But they are generally accentuated in the presence of a stallion or sometimes with other females. All these signs indicate it is the good period to show your mare to the stallion. Hand covering (stallion lay with a lead during the covering). It is better your stallion is isolated from the mare in order to take precise dates of covering and thus can be planned better for the echography. 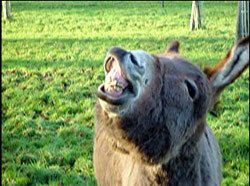 Artificial insemination is still rarely used for the donkey and it is still in an experimental phase. The Asinerie du Bocage collaborate's for this experimentation with the laboratory I.M.V. de l'Aigle. To find out more, refer to Artificial insemination. Before covering, the first stage is to choose the stallion, because the foal will profit at the same time from genes of its father and mother. For example, if the father is strong and very soft, the foal will have similar qualities. So we can understand the importance in choosing a good stallion. After being covered, the mare could have an echography, 15 days after being on heat. Sometimes the mare can have twins, considering the uncertain success of a twin pregnancy, as well as a premature tiredness of the mare, your veterinary surgeon in general will advise you to keep only one foal by elimination of an embryo (technical plucking). This procedure must absolutely be carried out as soon as possible, before 3 weeks. After the echography, if the mare is not fertilized, the veterinary surgeon will be able to seek the causes of them and if it is necessary to manage a treatment to cure the problem. For the mare, the gestation period is one year, sometimes 13 month. About three weeks before foaling, the udder increases in volume and 24 or 48 hours before the teats will have a waxy top. If the weather is very nice, it is better to leave the mother free outside. She will be isolated from the herd and generally, she does not need human assistance. If you have to keep her in the shelter, do it several days before foaling to not stress her. Before the foaling, the mare scratches the ground, lies down, stands up, starts to have contractions. All these signs are the start of an imminent foaling. The majority of foaling happens in the night. When a mare is foaling for the first time, it is necessary to avoid speaking to, and disturbing her, but supervise very discreetly. If you intervene to encourage the delivery it or take photographs the mare could reject her foal. The act of foaling is quite quick, about 15-30 minutes. About fifteen minutes after the foal is born, he is able to walk, the young should start to search for the mare's udder. The mare's colostrums (first milk) is most important to the foal, the antibodies in this milk protect the foal over the first few days of life. The foal will be given an anti-tetanus injection the next morning and an injection of "Trivalent" (10cc) to protect him against the septicaemia. The mare is on heat between nine to twelve days after the birth. For this period, milk can change quality, which can induce a light diarrhoea to foals. It is frequent and a completely normal phenomenon. If the mare should not be covering, the owner has to make himself, the declaration of the foal's birth to the National Stud farms within ten days. In the contrary case, this step will be taken directly by the stud owner on the declaration of the first covering. Which name to choose ? Foals born in 2012 must have a name beginning with the letter "C". We advise systematically to add an affix to allow an easier follow-up to the S.I.R.E. (organization which ensures the management of the herd books for equidaes). So, that prevents the name of your donkey being followed by a number (ex: Pompon1, Pompon2...) if several donkeys have the same name. For example, every donkey born at the Asinerie du Bocage have a name ending in "du Bocage": "Kyky du Bocage"
The complete name should not exceed 21 letters with the intervals.